What Technological Development Will Most Reduce Climate Change? Answer the question above and you could win a trip to Masdar to join Abu Dhabi Sustainability Week as a VIP guest! Masdar hosts an annual blogging contest and the winner (flight + accommodation covered by Masdar) joins the VIP Media group for exclusive opportunities and access at several key events, to leading cleantech projects, and with global cleantech leaders. 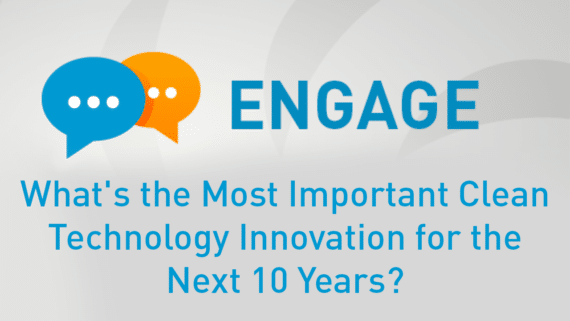 “The most important clean technology innovation for the next 10 years? Honestly, with so many options on the table, I think that’s a tough one. But it’s also a fun and exciting topic to write about and I’m sure many of you have strong opinions about (and arguments for) one technology solution or another. I’ll have to brainstorm a bit more to determine my response. In the meantime, I hope to read some of yours! “Trying not to lead anyone too much, I’ll just highlight that this solution could concern electric cars, solar energy, wind energy, robotaxis, energy storage, water desalination, the hyperloop, etc. The solution can be technical, related to policy, or related to a certain business or nonprofit approach. A 500- to 700-word written blog that articulates your ideas (cross-post on your blog and send the URL to Masdar here, or send in MS Word to press@masdar.ae. Create your submission, post it, and post a link (as in a YouTube or blog URL) within the comments section of the 2017 Masdar Engage Contest page (if you are unsure of where to post, or in the case of written submissions you do not have a blog, you may send submissions to press@masdar.ae). We encourage you share your contributions on all social media channels, using the hashtag #WorldIn2026. It is also recommended to share your social media posts related to your submitted content on Masdar’s Thunderclap platform. IMPORTANT: Leave a comment on the 2017 Masdar Engage Contest page with a link to your post AND do not forget to mention the 2017 Masdar Engage Blogging Contest within your submission and the platforms on which you are sharing your content. Qualifying content will be posted on the Masdar web site. Limit one (1) entry per person. Winning Selection: A judging panel will review qualifying entries and will weigh: a) the overall quality of the submission, b) the number of votes for the post on the Masdar Engage website; c) and the number of Tweets, Facebook “Likes” and “Shares” through social channels (on both Masdar and the writer’s websites). Voting will continue until January 7, 2017. Prize: One winner will be selected for a paid trip to Abu Dhabi Sustainability Week during mid-January 2017, will be honored as Masdar’s VIP Social Media Influencer throughout Abu Dhabi Sustainability Week, and will post regular updates during the event. The winner may also be asked to participate in an event during Abu Dhabi Sustainability Week. The winner must be able to arrive in Abu Dhabi in time for the opening ceremony on Monday, 16 January 2017, and must be able to stay in Abu Dhabi through 19 or 20 January 2017. Prize Restrictions: Winners are subject to verification, including verification of age. If the winner resides within a 100-mile radius of Abu Dhabi, ground transportation may be provided in lieu of air transportation. Winners are responsible for having valid travel documents, including a passport. Employees of Masdar, its partners and subsidiaries are not eligible for Masdar’s Engage blogging contest. Entry Requirements: Submissions must be the original work of the entrant; may not have been used previously for public display; must be suitable for publication; may not be promotional endorsements for brands or companies; and may not contain any copyrighted works owned by other parties. Entries will be reviewed for compliance with these rules before being published and/or judged. Masdar makes the final determination as to what entries are eligible. Commercial Use of Entries: Submission of an entry grants Masdar the unconditional, irrevocable, worldwide right to publish, use, edit and/or modify such entry in any way, in any and all media, without limitation, and without consideration to the entrant, winning or not.